Our Young Company are back this Summer in The Drum with a totally exciting new production called The Blue Road written by Laura Lomas. Commissioned by Dundee Rep, Derby Theatre, Royal & Derngate and Theatre Royal Plymouth; an inspiring project which will see this brand new play premiere in four venues across the UK. 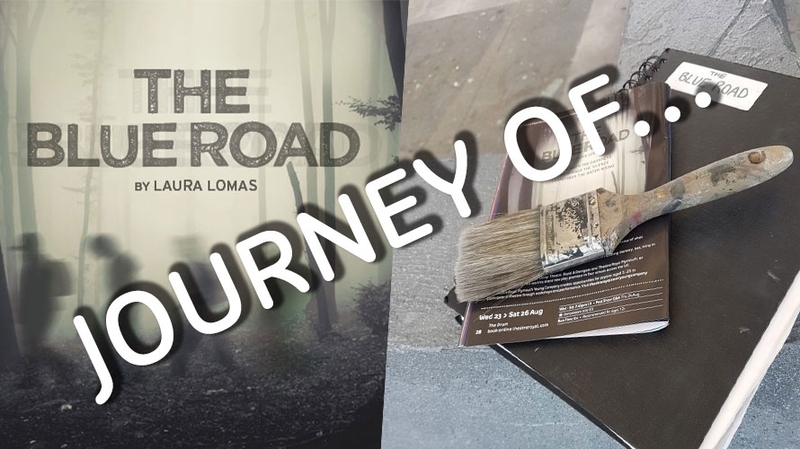 In the build up towards performance week we will be resuming our weekly blog posts giving you an exclusive behind the scenes sneak peak of the journey of The Blue Road. This week, to mark our first one, we’d like to introduce you to Designer, Nina Raines, who was previously a member of the Young Company and now works professionally as a theatre designer. Let’s begin! What inspirations did you have when designing for The Blue Road? In designing The Blue Road I worked closely with Director, Nik Partridge. We looked at the themes of the play including young people facing situations of trauma and loss, and referenced examples of real crises in the research and initial ideas process. I was interested in the idea of presenting the setting in a less tangible way in the space than could potentially be interpreted by the script. The journey from model to the get-in is quite some time, what difficulties do you face during that time? The process of designing the set from initial sketches and ideas, to a scale model box, to the get-in can be a challenging process. It is about solving problems to realise those ideas and translate a design into reality. This means taking into consideration the budget, time constraints/deadlines, and what materials are best to use and where to source them in order to best achieve the final outcome. What is it that excites you most about designing? Designing a show is a really exciting job. There is something really satisfying in seeing my 1:25 scale model essentially enlarged into reality. I love theatre and the way that set and costume serves to enhance a performance for me is so exciting. Being a YC member previously, how does it feel to now be working with the company again? I joined the Young Company when I was 14 and it’s a really nice thing to be able to come back and work with the company. As a Young Company member I’d attend weekly sessions at TR2 and this is where my interest in theatre was sparked, so it’s a great feeling to have gone from the Design group when I was young, to finishing my degree in Theatre Design and now back to where it all started, but as the Designer. It’s also really good to see the next generation of theatre makers getting involved, and a bit of nostalgia for me working on a summer show as I was involved in each one for a few years and I had the best time. Without giving too much away, what can you tell us about the design for The Blue Road? The set for The Blue Road will not be presented in the standard Drum seating format that most people will be used to. The set design is evocative of the forest environment that the characters are in without being restrictive to any one setting, as there are different layers to the script and different stories happening. I’ve enjoyed also doing the paint work on the set, and sourcing costumes that feel right for the characters. How did you get involved in Designing? I’ve always been creative, I loved art at school and then when I joined the Young Company my eyes were opened to the world of Theatre Design! I got involved in the productions which were always great fun, and my interest grew as it became more than just an after school hobby. I took art and drama A-levels (opting for design modules in drama) and then went on to my degree at Rose Bruford College of Theatre and Performance. Since then I’ve been working at TR2 as an assistant in the workshop, which is fantastic, and taking on different design projects including The Blue Road. I love what I do and would say it really is thanks to the Theatre Royal that I am able to say this. Are there moments of designing you find difficult? Designing set and costume for stage can be a challenging and sometimes stressful. Everyone has their different strengths and there are areas of the job that I am better at, but overall it’s rewarding. There have been times when I have been struggling to design and then source the right costumes for a play and it can be a bit difficult, but usually I am lucky to have a great team of people to work alongside. Having graduated a year ago and worked on some great projects since then, I’ll soon be going back into education to study a Master’s degree in Scenic Art. Alongside designing, I really love being hands-on with set painting and so studying this for a year will really broaden my skillset. As well as design then I will be able to work as a scenic artist and hopefully paint some lovely and interesting things that I or other people have designed. 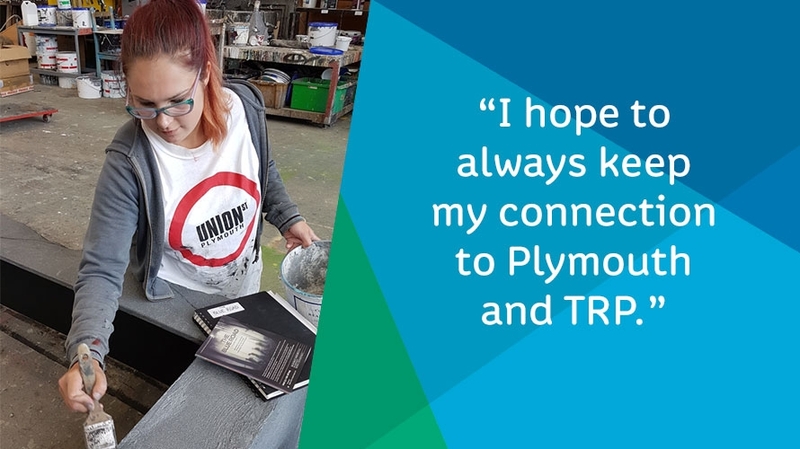 I hope to always keep my connection to Plymouth and TRP. 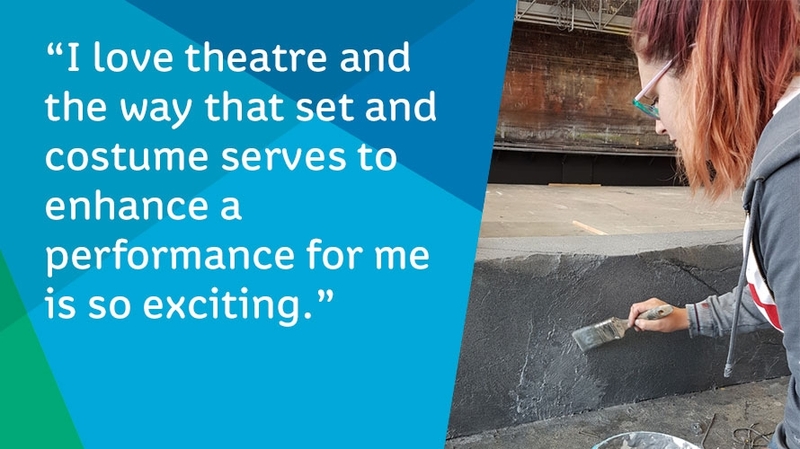 See Nina’s set design in full when the Young Company take to the stage for The Blue Road on Wed 23 > Sat 26 Aug.
And keep an eye out for our next Journey of…The Blue Road blog posts for even more exlusive insight!